The Kodak Playfull Ze2 is a great little video camera for $99 USD or less. What it lacks in quality and features it gains in versatility thanks to its lifeproof specifications. We found that overall quality is good, with only a few annoyances. 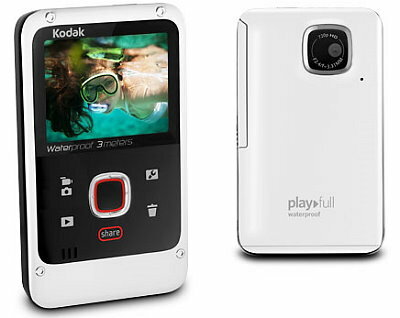 The Kodak Playfull Ze2 is one of their latest pocket-sized HD video cameras for 2011/2012. This model builds upon the Ze1 we tests last year, with some new upgrades; along with some downgrades as well. While the Ze2 adds a larger 2.0-inch LCD screen, a small more compact body, and waterproof, shockproof and dustproof specifications; it lacks the full HD video and 5-megapixel still option found on its predecessor. This isn't all bad, especially when you consider the versatility that you can take the Ze2 about anywhere. These options alone make the Ze2 an appealing pocket video camera. You can still capture 1-megapixel stills, along with 720p HD video at 30fps. The lens has been upgraded slightly as well. While it still offers s 35mm (equivalent) fixed focal length, the maximum aperture has been opened up to f/2.4 (compared to f/2.8 on the previous model), giving it a light edge when shooting in lower lighting; like indoors or outdoors at night. Although there is not an optical zoom, you do have access to a 2x "Smooth Digital" zoom options, which helps you get a bit closer to your subjects. Rounding out the Ze2's feature list are in0camera "Effect Modes" for both stills and video, a built-in Li-ion battery pack, AV and HDMI output ports (optional cables required), a built-in USB plug for charging and sharing content, and a SD card slot for SD and SDHC cards up to 32GB. The most notable features of this camera have to be its "Lifeproof" ratings. The camera is waterpoof down to 10 feet underwater (IEC 60529 IPX8 rating), dustproof (IEC 60529 IPX6 rating), and drop or shockproof from a 5 foot drop (on plywood, MIL-STD-810F rating). This makes the camera a likely candidate for those with active lifestyles, who wish to capture the action of their adventure without having to worry about their gear. The body itself is very small, measuring just 2.2 x 3.7 x 0.5 inches and weighing only 3 ounces with a SD card installed. I found slipping this camera into my jeans pocket to be effortless; and it almost disappeared in my pocket. There's virtually no bulk whatsoever. I compare the size to maybe a half of a deck of playing cards. The limited on camera controls are very easy to understand and use; for the most part anyway. They are clearly labeled with easy to understand symbols, however I found manipulating them to be cumbersome at times. You have to apply a good deal of pressure to the buttons; especially the 4-way controller and record/shutter button. This wasn't a huge deal once you get use to it, however it was worth noting. The built-in USB 2.0 plug gives you the ability to charge the camera anywhere there's an open USB plug, and it also handles transferring files to your PC. The plug itself is not an arm like other models we've tested; rather it's a small plug on a short wire. I personally would have liked to see the wire be a few centimeters longer, but it is long enough for you to plug it into you PC or Mac easily. The first time you plug the camera in, the drivers will automatically be installed and you will have the option to install the Kodak Share Button App (v4.0) and ArcSoft MediaImpression for Kodak. While it's not mandatory that you install this software since the files are stored on a SD card, it is required if you want to utilize the camera's auto-upload sharing options. When you tag files in playback on the camera to be "shared" with your Facebook, YouTube, etc., these apps are what handle uploading everything once you plug the camera in. After you setup your social media sites and email address the first time, the Kodak Share Button App will remember your log-in credentials and upload any tagged files anytime you plug the Ze2 into your PC's USB port. Another cool thing about this app is the fact that it updates the sharing options when you plug your camera in. After I plugged it in the first time, it added CVSphoto and Walmart_USA to the available options. All together, it's a slick and easy way to share your photos and videos. The only issue I have with this Kodak Share Button App is that you have to allow it access to your personal information, such as your YouTube log-in, Facebook profile (with access to all of your information at any time, photos, etc. ), along with entering your email address and your email password when wanting to use the Email function. I always get a little uneasy when giving away my private information; however to some this will not matter one bit. Video quality is pretty decent for a compact video camera. While you can only record 720p HD video, it's still plenty large enough to enjoy on wide format monitors and HDTVs. Plus, the whole idea behind this camera is to have a compact solution that allows you to quickly share with friends. Having large 1080p files would put a slight damper on uploading files quickly to social media sites anyway. Playback on my PC was great, with nice smooth video playback and pleasing quality. Using the digital zoom will exacerbate noise and other artifacts, so using it sparingly. In our zoom sample, you can see how quality degrades as you zoom in. The Audio portion was Ok, however the mic pics up even the slightest breeze outdoors. Another annoyance I had was with the built-in speaker. Even with the volume cranked all the way up in playback, you can barely hear anything. If you want to share videos with your friends and family that you see in person, I highly recommend you pick up the appropriate mini HDMI cable for this camera. While the Ze2's quality is not comparable to a digital camcorder, it is in line with most digicams and should suffice for most user's needs; especially those users who are more concerned with capturing the action than capturing uber quality video. The Ze2 also offers the ability to snap 1-megapixel still photos, of you can cut our frames from your video files. The 1-megapixel still mode offers a nice way to take quick snap shots, with minimal shutter lag. These files actually look quite good with all things considered, and should be sufficient for uploads to Facebook, etc. There is no flash or media light, so indoors you will battle with lighting a bit. Thankfully the 35mm lens offers a fast f/2.4 aperture, which does help in these low-light conditions. Overall, the still image more is a welcomed option, that produced better than expected results when there's plenty of light; like outdoors. While the camera is underwater capable, due to it being winter here in the Midwest, we were unable to get some usable underwater stills or video for our review. We did however test these features, and found that the camera works well when submerged. You face the same challenges underwater as you would with any waterproof camera (white balance, lighting, etc.). The Ze2 does offer a new Underwater Correction option, which helps the Ze2 focus better an offer more true to life color. This option if found at the bottom of the settings menu. Whenever you plan on taking the Ze2 underwater, check to make sure both of the port doors are in the locked position. Kodak claims the Ze2's built-in Li-ion battery can power the camera for up to 75 of video recording. During our tests, we were able to capture about 25 still photos and various short video clips with plenty of power to spare. Every time you plug the camera into your PC via the USB cable, it charges the camera's battery. So, we found that as long as you are plugging the camera in regularly to share your photos and videos, or save your files to a PC, you shouldn't have any real power consumption issues. Unfortunately, because this camera uses an internal battery, you can't pick up a spare. While we did not test this, we're willing to bet that some of the mobile phone car chargers that offer a powered USB port would charge the Ze2 just fine; however try at your own risk. Bottom line - Kodak has created a fun and easy to use digital video camera that is sure to stand up to the adventurous user's lifestyle. While it may only capture 720p HD video and 1-megapixel stills, the Kodak Playfull Ze2 gives you everything you need to capture pleasing video and stills for uploading to your favorite social media sites. With a price tag of $99 USD or less, the Ze2 offers great bang for your buck, and is considered affordable by some of the tightest budgets. If you want higher quality still or video, you'll have to spend some more boot.